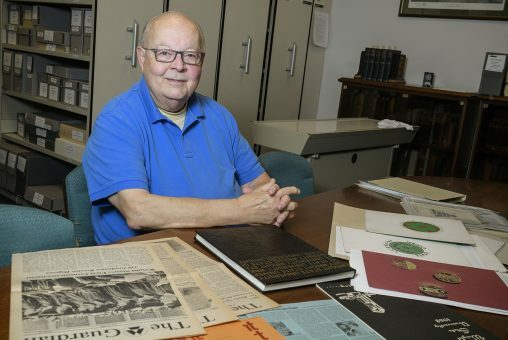 Gary Barlow, one of the first two faculty members to arrive in 1964 at what would become Wright State University, is supporting the Discover Your Story campaign to create a new home for the university’s priceless Archives. As he pored through newsletters, yearbooks, old issues of The Guardian — and even sketches of the first Wright State University logo that he helped design — memories of the university’s earliest days flooded Gary Barlow’s mind. Barlow first arrived in Dayton in the early 1960s. As a faculty member at Miami University, he oversaw the school’s art education program and supervised Miami’s student art teachers in the Dayton area. When the opportunity came about to help build the Dayton Campus of Miami University and Ohio State University, Barlow jumped on board. In 1964, he was one of the first two faculty members to arrive on the campus of what would later become Wright State University. “It was a big, exciting, really scary challenge,” he recalled. Barlow fondly remembers teaching his first art education class in Allyn Hall as workers on big scaffolding were putting up the ceiling. For Barlow, all of those memories come to life once again when he visits Special Collections and Archives. “The Archives help to revitalize our history,” he said. Whether taking a trip down memory lane to the earliest days of Wright State or looking at the world-renowned Wright Brothers Collection, Barlow always discovers something new in the Archives. For example, Barlow didn’t realize that Special Collections and Archives houses the personal collection of Walter “Matt” Jefferies, the art director for the original “Star Trek” television series. Jefferies, who designed the famed Starship Enterprise, donated boxes of Kodachrome slides with images of the first few “Star Trek” episodes to Wright State, along with thousands of aviation photographs and books — some even autographed by actor William Shatner, who portrayed Captain Kirk in the series. Discover Your Story will transform the former corporate headquarters of the Wright-Patt Credit Union at 2455 Presidential Drive into the new home of Special Collections and Archives. A political aficionado, Barlow is especially fond of the many photographs of former presidents and cabinet members in the Archives. Barlow has long understood the importance of documenting history. Along with the late Lew Shupe, professor emeritus in the Department of Communication, he worked on the Wright State University Retirees Association Oral History Project interviewing many of Wright State’s founding faculty and staff. When the university announced in October 2017 that it was launching Discover Your Story: The Campaign for the Wright State University Archives Center, Barlow knew this was a project he had to support. 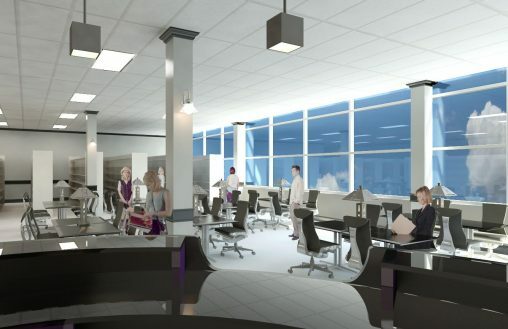 The $6.5 million fundraising campaign will transform the former corporate headquarters of the Wright-Patt Credit Union at 2455 Presidential Drive into the new home of Special Collections and Archives. The Archives Center will almost triple the space for the university’s world-renowned collections — from 12,000 square feet scattered across two buildings to nearly 30,000 square feet in one central location. Even though he retired from Wright State in 1993, Barlow remains engaged with the university through his involvement with the Retirees Association and the Friends of the Libraries board. “It’s like I never left, in a way,” he said. 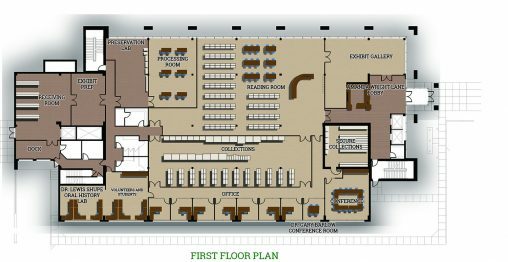 Artist rendering of part of the reading room and help desk. Barlow can rest assured that the history of the university he helped develop — and document — as a founding faculty member will live on for generations to come in the Wright State University Archives Center.